Patrick Muller is a sound creator with a focus on interactive systems and experimental design processes. He develops concepts and content, initiating, coordinating and directing projects in the area of sound art, installation work, sound branding and performance. 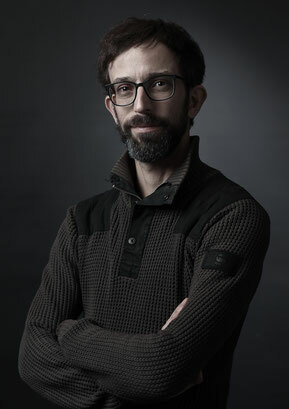 he realizes interactive sound installations and performances, composes music for theater and dance, programs audio and video applications, explores innovative creation processes and techniques. Currently, he is working on a series of art installations for the Luxembourg pavillon at the Expo 2020 Dubai. He co-founded *Invisible Design and works as as a freelancer for agencies such as MetaDesign, Wesound, PRJKTR, for clients such as Lufthansa, Siemens and Volkswagen. He is a design and interaction consultant for the award-winning atelier OBLIQUE. Patrick teaches sonic interaction design at the HDPK (SRH Hochschule der populären Künste) in Berlin, and develops lectures and workshops about sound, experimental composition, and artistic approaches to defined scenarios. He studied sound art, experimental sound creation, and sonic brand communication at the University of Arts (UdK) in Berlin with Prof. Karl Bartos (Kraftwerk), Prof. Sam Auinger, Prof. Dr. Martin Supper, Prof. Robert Henke (Monolake, Ableton); music composition and music production at the Liverpool Institute for Performing Arts (LIPA) in Liverpool, UK; sound technology at the SAE Institute in Cologne, Germany. Before and during his studies, Patrick was on tour across Europe and the UK with several bands and electronic projects as a musician – piano, percussion, drums, electronics, voice. Over the past years, he has been working in England, Belgium and Luxembourg. He currently works and lives in Berlin, Germany.